The fog of uncertainty cast by rising seas is starting to lift from $25 billion worth of public projects planned in San Francisco. The City by the (rising) Bay, where bayfront shorelines will continue to experience worsening high tide flooding, where the nearby international airport is among the nation’s most vulnerable to floods, and where Pacific Ocean shoreline erosion could be accelerated by sea level rise, has adopted a first-in-the-nation approach to assessing potential infrastructure risks posed by rising seas. 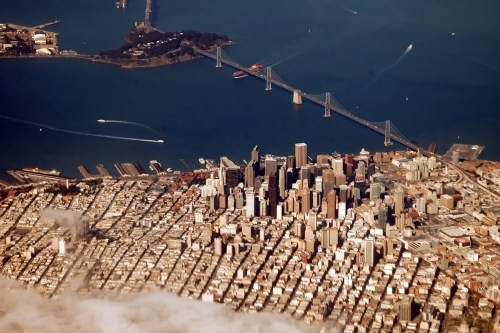 San Francisco's downtown was built along its waterfront. The new guidance, which includes a simple project checklist, will help officials incorporate sea level rise into decisions about building and upgrading everything from pipes to police stations to streets. Seas have risen 8 inches since industry started burning fossil fuels, although long-term ocean cycles have temporarily spared the West Coast from some of those impacts in recent decades. Two or three more feet of sea level rise is forecast globally this century. The guidance was adopted last month by the city’s capital planning committee, a group of lawmakers and city officials formed nearly a decade ago to guide and prioritize byzantine capital spending by departments and agencies. According to the committee’s most recent biennial report, such spending will slightly exceed $25 billion during the next decade. The checklist process is simple, designed to create a high-level picture of a proposed infrastructure project’s future flooding risks. Some facilities, such as parks, can easily withstand occasional flooding. A hospital or fire station, by contrast, could be crippled if the land upon which it was built became permanently inundated. The new checklist helps figure out where a project’s flood risks lie between those extremes. The checklist requires a city official to review sea level rise inundation maps to determine whether their infrastructure project will be located in a floodplain under different sea level rise scenarios — or on land that could become permanently inundated. If either of those is the case, then the official ticks a series of “high,” “medium,” or “low” boxes. The boxes indicate how severely anticipated floods would affect operations at the project, how well the infrastructure would recover from a flood, and the extent of projected costs associated with cleaning up after it is waterlogged. Finally, the official jots down sea level rise adaptation measures that are being incorporated into the project. The process is straightforward, but not prescriptive. A project won’t automatically be abandoned if sea level rise risks are found to be high. Rather, the findings from the checklist will be used to guide decisions by officials and lawmakers regarding whether a proposed project makes sense, whether it makes sense where it is planned, and whether it needs to be redesigned to reduce flooding hazards — or constructed in such a way that it can be easily adapted later. The capital planning committee doesn’t have the power to veto or approve a project, but it advises lawmakers on whether they should approve its costs. The guidance was adopted five years after San Francisco-based urban think tank SPUR published a report highlighting the need for Bay Area cities and counties to start planning for climate change impacts, and less than two years after San Francisco’s mayor assembled a city committee to do just that. Downtown San Francisco and the Bay Bridge. 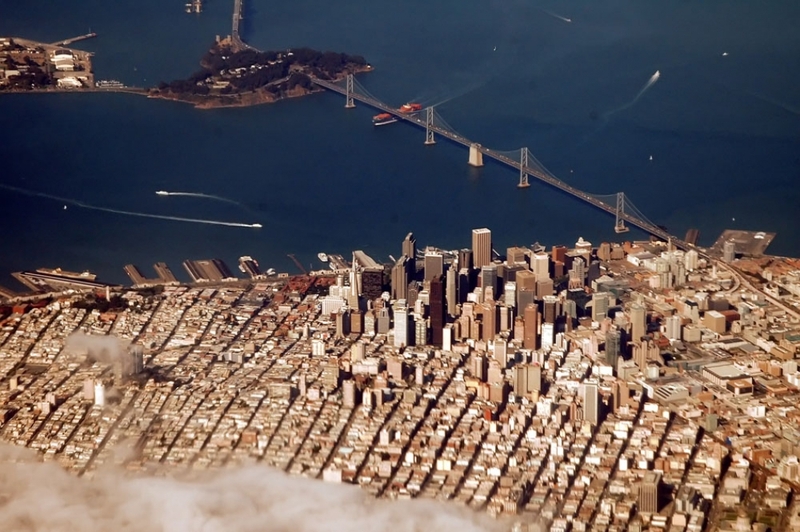 SPUR policy director Laura Tam, who has spoken out in the past about the dangers of lackluster and uncoordinated climate adaptation planning in the San Francisco Bay Area, praised San Francisco’s new guidance. A representation of what San Francisco's Crissy Field would look like under 12 feet of sea level rise. The guidance currently relates only to public projects. San Francisco capital planning official Brian Strong, who helped write it, said he hopes that it “leads to reforms” within the city’s planning and building inspection departments, which could use similar processes when assessing risks associated with proposed private developments, such as new homes and neighborhoods. But individual assessments for projects won’t be enough. City officials say sea level rise will start figuring in neighborhood-wide planning efforts, including along its vulnerable northern bayfront, which is a thriving hub of tourism — the city’s most important industry. One major decision that the city is going to start trying to make in the coming months, through what planning department staff say will be a public process, will be how to manage flood risks at Mission Bay, a booming redevelopment area close to the ballpark and near the city’s downtown. The city is building its main public safety building there, in what could become a flood plain. Flood gates are being considered to reduce flooding risks, along with various urban design solutions. As conversations such as those proceed in the coming years, they will be accompanied by an evolution of the new sea level rise guidance and checklist. The city plans to review the guidance in four years, or sooner if need be, as lessons are learned and science advances.